Thousands of Scientologists and their guests converged in Sydney, Australia on Sunday, September 4, for the unveiling of the stunning new spiritual home for the Church of Scientology. The dedication signals exponential expansion of advanced spiritual progress for parishioners across the Asia Pacific region. Mr. David Miscavige, Chairman of the Board Religious Technology Center, greeted the more than 2,500 Scientologists from throughout the region who were on hand to celebrate the opening of the new Ideal Advanced Organization for Australia, New Zealand and Asia. Mr. Miscavige was met with unbounded applause when he took the stage for this historic opening ceremony in Sydney, Australia. Scientologists and their guests gathered near Sydney’s Lane Cove National Park, September 4, to celebrate the dedication of the region’s striking new Scientology spiritual headquarters. Scientologists from across the Asia Pacific erupted in celebration as Mr. Miscavige pulled the ribbon to dedicate the new Ideal Advanced Organization. In an idyllic setting on a perfect Sydney afternoon, thousands took part in the dedication ceremony. Led by Australia’s own award-winning singer and songwriter, Kate Ceberano AM, the ceremony commenced with a medley of music and dance representing the diverse tapestry of cultures across the region. Under Mr. Miscavige’s vision and leadership, the Church of Scientology has opened the doors of well over 50 new Ideal Organizations and Ideal Advanced Organizations. Those openings have been the catalyst for worldwide expansion of the religion—greater in the last decade than in the previous 50 years. 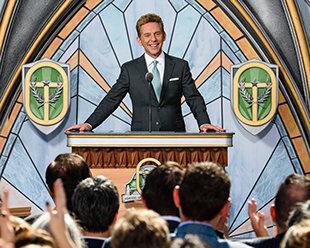 Mr. David Miscavige with (left to right): Ms. Le Lam, Mayor Emeritus and Chairwoman, Asian Cultural Association for Greater Sydney; Dr. David Bennett AC, QC and former Solicitor General of Australia; Ms. Gracelyn Smallwood, Order of Australia Recipient and Professor at James Cook University; Dr. Keith Thompson, Associate Dean, University of Notre Dame; and Dr. Amin Hady, former religious advisor to the Australian Prime Minister. After the ribbon fell, the crowd surged into the expansive new Church, eager to see the facilities where they will progress through the state of Clear and Advanced Levels. Attendees were thrilled with their first glimpse of the new Ideal Advanced Organization for the Asia Pacific region. Guests took in the beauty of this one-of-a-kind facility and its picturesque surroundings following the ribbon cutting. Ideal Church of Scientology Sydney Opened May 3, 2014, in the center of the city, the Sydney Church stands as the Continental Ideal Organization for Australia. Ideal Church of Scientology Melbourne Melbourne’s Church was the first Ideal Organization in the region, opening their doors on January 29, 2011. Ideal Church of Scientology Kaohsiung The first Ideal Organization for Asia, the Kaohsiung Church opened 7 December, 2013. The 108,000-square-feet facility services Scientologists from across Taiwan and Mainland China. Ideal Church of Scientology Tokyo Located just minutes from Tokyo’s Times Square in the beating heart of the city, the Tokyo Church opened 8 August, 2015, as a spiritual beacon for Japan. Just ten minutes from Sydney’s city center, yet a world away amid 900 acres of arboreal forest in the Lane Cove National Park, the stunning new spiritual home for the Church of Scientology was inaugurated before thousands at its dedication on Sunday, September 4. The Church’s newest and largest spiritual center outside the United States is destined to be a beacon of freedom for the Asia Pacific region. An architectural masterpiece with soaring windows that open onto views of the national park, where kookaburras trill at dawn and dusk, the massive and masterfully-restored 145,000-square-foot building is a physical wonder that gives meaning to the spirit of Scientology itself. The historic event comes in the wake of a new Golden Age for higher states of spiritual awareness in Scientology. It’s a Golden Age comprising yet another monumental achievement in making Scientology technology available. They include Founder L. Ron Hubbard’s original Advanced Course film lectures now fully restored, and advanced materials extending to the upper reaches of the Bridge to Total Freedom, which have been translated into 17 languages, including Chinese and Japanese. Consequently, Scientologists are ascending the Bridge at seven times earlier numbers. The new Ideal Advanced Scientology Organization is equipped to accommodate these numbers with facilities that include a Hubbard Guidance Center, replete with 60 auditing (spiritual counseling) rooms, course rooms for the training and guidance of Solo auditing (parishioners auditing themselves through the state of Clear and Advanced Levels), and course rooms for the training of auditors to serve in Scientology Organizations across the Asia Pacific. The expansive facility also houses a new Ideal Continental Liaison Office for the ecclesiastical management of every sector of Scientology in the region. That includes Scientology Churches, Missions and affiliated groups, as well as the establishment and expansion of Church-supported humanitarian initiatives and social betterment programs. That one-of-a-kind locale was the site of convergence for the more than 2,500 Scientologists and their guests on Sunday who came together to celebrate this remarkable achievement. Joining them were city and national dignitaries partaking in the occasion. The dedication of the Ideal Advanced Organization and Saint Hill for Australia, New Zealand and all of Asia comes during a period of epic expansion for the religion. Under Mr. Miscavige’s leadership the Church of Scientology has opened the doors of more than 50 new Ideal Churches across six continents. Recent openings have taken place in Harlem, New York; Budapest, Hungary; Atlanta, Georgia; Milan, Italy; Tokyo, Japan; Bogotá, Colombia; and Basel, Switzerland. The Church recently opened Scientology Media Productions as well, a five-acre, technologically cutting-edge studio in Hollywood, California, in which the religion’s message will be proclaimed via television and radio broadcasting, Internet and social media and every other media platform. More Ideal Org openings are planned in the coming year for cultural epicenters in New Zealand, Europe, Latin America and North America.